A petition to save up to 10 libraries threatened with closure by government cuts has been launched by two sister weeklies. The Accrington Observer and Rossendale Free Press are calling on readers to help save the libraries on its patch, after Lancashire County Council announced it may have to close up to half of the libraries under its control. The authority says shutting one library in each of its 12 district council areas would meet its statutory obligations, but has warned that none are safe from the axe. The two newspapers launched the petition on their respective front pages on Friday 20 November. 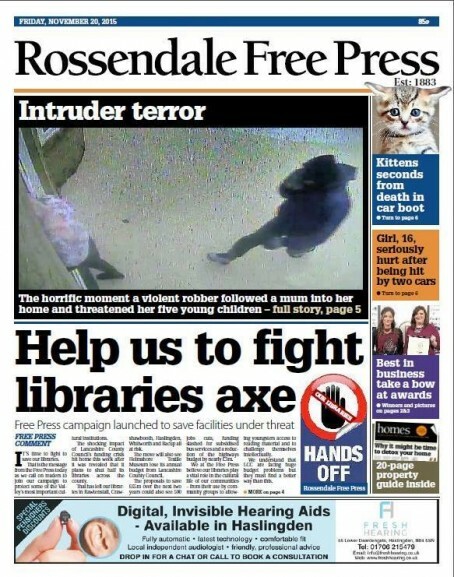 In the borough of Hyndburn, on the Observer’s patch, libraries in Accrington, Oswaldtwistle, Rishton, Great Harwood and Clayton-le-Moors are under threat. In Rossendale, facilities at Rawtenstall, Crawshawbooth, Haslingden, Whitworth and Bacup are at risk. Gareth Tidman, who edits both titles, said: “Please sign the petition to show your opposition to these plans.